Enerpac announces it will showcase a wide range of tools and heavy lifting equipment at Gold Lot booth G1127 at ConExpo. The company plans to show live demonstrations of the SPMT600 self-propelled modular transporter and display the 585-ton SBL500 hydraulic telescopic gantry, which has four towers in the first stage. 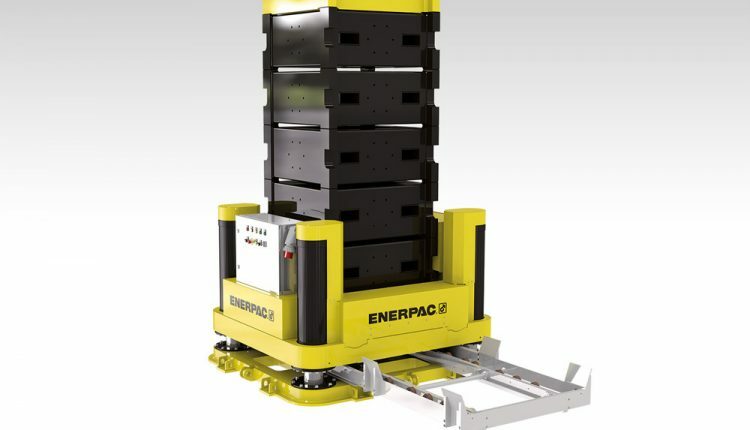 Additionally, Enerpac will show the new JS250 jack-up system, the computer controlled HSL7006 strand jack, the EVOB816J synchronous lifting system, and SFP404SJ split flow pump. Enerpac heavy lifting systems and bolting tools are used on some of the industry’s largest construction projects, including the world’s largest overhead offshore crane to construct a new offshore highway for Reunion Island in the Indian Ocean, the recent Fore River Bridge replacement in Massachusetts, and the installation of 25,000-ton caissons for the MOSE flood prevention system in Venice, Italy. Additionally, Enerpac is focused on providing the most comprehensive line of globally-supplied, locally-supported industrial tooling solutions through its distributor network. These tools are designed to increase productivity and make work safer and easier to perform. Working tool demos in the Enerpac booth will include the PTW-Series pneumatic torque wrenches and ETW-Series electric torque wrenches, high tonnage cylinders, XC cordless pumps and Pow’R’Lock self-locking lifting system.